The Cumberland Geological Society has selected Danielle Serratos to be the next Director and Curator of the Fundy Geological Museum. 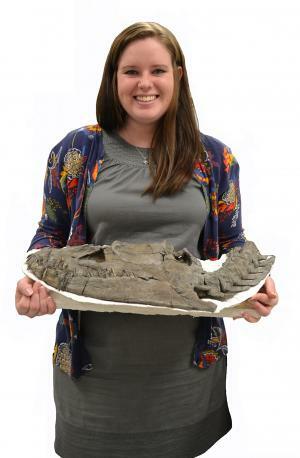 Serratos has worked previously at the University of Alaska Museum of the North, the U.S. National Science Foundation STEPPE Coordinating Office, and most recently at the South Dakota School of Mines and Technology Museum of Geology. Serratos brings a fresh perspective to the Parrsboro Museum because her area of specialty lies with Mesozoic marine reptiles, specifically the long-necked plesiosaurs that swam in Cretaceous seas the same time T. rex was walking around on land. She is a vertebrate paleontologist who holds a M.S. from the University of Alaska- Fairbanks and a B.S. from Texas A&M University- Corpus Christi. “The Fundy Geo Museum has made significant contributions to our understanding of Earth’s history and I look forward to continuing this work. The Fundy has a rare reputation for being a true community Museum and I am eager to get to know the locals and build upon the wonderful relationships that it has developed these past 25 years,” Serratos said. Serratos will be hosting a Meet and Greet, from 10:00 AM to noon, in conjunction with the Celebration of Fall event at the Fundy Geological Museum Saturday, October 13, 2018. The Celebration of Fall offers family-friendly activities both in the Museum as well as the surrounding area in the form of guided hikes both Saturday and Sunday ($20 + tax per person) and educational arts and crafts ($5-$10 + tax). Visit the Museum’s Event page for further info on the event.